Bluebonnets are blooming once again along Midway. In the fall we sowed more wildflower seeds, hoping for their return. Thursday, April 25th – Plant sale and DCMGA monthly meeting. Tuesday, April 30th, 11am- ‘Planting the Edible Landscape – the Spring/Summer Collection” with Linda and Ana to share the plants chosen and the reason behind the choices. Class and tour to be provided. Tuesday May 7th, 9-11am Turf talk and demonstration by Stephen Hudkins. Grow and Graze reservations will be posted approximately one month before the event. 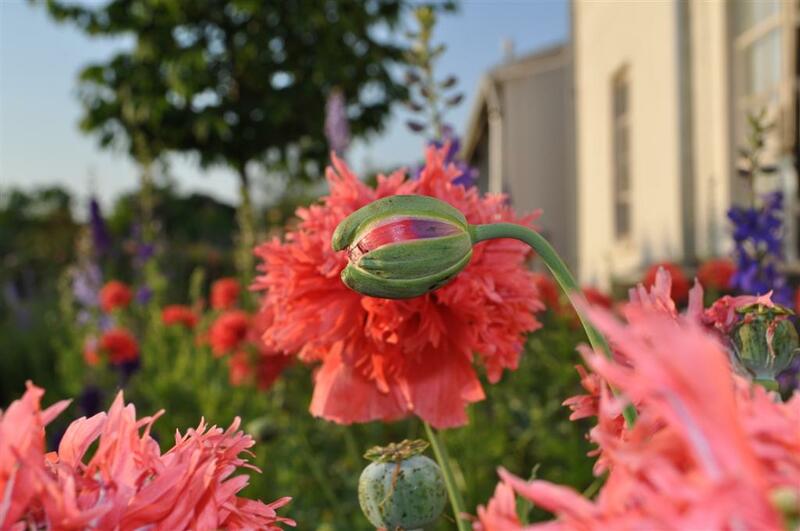 Posted in Spring and tagged Bluebonnets, Dallas County Master Gardener Association, Dallas County Master Gardeners, Grow and Graze events, spring blooms, Texas wildflowers, The Raincatcher's Garden, Wildflowers of Texas. Bookmark the permalink. Well, I’m flattered you asked. This spring we had the shortest growing season I’ve ever experienced in all these years. We had one big flourish of zucchini and yellow squash and then production was halted because of the intense early heat and lack of rain out west of Ft Worth where I veggie garden. This area is not the same growing zone as Dallas! Squash plants were babied when the spring would not come and covered up when a freeze came through in late April; then the heat came with a vengeance. Plus I am ruthless for “squashing” the squash bugs and their eggs that always appear. I am blaming the limited squash harvest on the on the heat and lack of rain. Patti, we agree it’s not your fault! The only thing we are harvesting now is jalapeños and Serrano peppers. Bell peppers are struggling. We usually get our most productive harvest of peppers in Oct and Nov. It was 111 degrees one weekend in July! We are sandy loamy soil. So you can imagine how things are barely hanging on in the veggie garden. We are not on a drip irrigation system in the garden. I have mulched and mulched again which has helped. We were a failure at beets. Not sure why. I do have a loofa growing on supports that the English peas were growing on in the early spring, But It hasn’t bloomed yet. For the fall we always plant the following: mustard and turnip greens, garlic, spinach, turnips and kale. Sometimes we don’t plant the spinach or kale till November. I will be planting a new area for wildflowers in September. I have harvested many wildflower seeds from this past spring! Just hope we get the rain for those to germinate. Our farm locate west of Weatherford is experiencing big time drought. Orb Spider Spins a Victim! My recent video of a hummingbird hawk moth and a picture of an Orb spider mummifying a grasshopper have been our entertainment. All from out here in Palo Pinto county!! Patti, did you get any rain in the last week? Yes!!! As of August 19th, we have received almost 3 inches!! I’m seeing my bluebonnets sprouting!! I have a new seeded wildflower plot that is 20 X 25 feet. That makes me happy. Loofah is vining like crazy. Still waiting on it to bloom. Tomatoes and peppers have so many promising blooms!! I have a few tomatoes on the vine too!! Temperatures although mostly still in upper 90s with lows in the low 70s are making my garden happy. Black eyed peas are up along with mustard and turnip greens. Kale is up because I shook the dried seeds from my kale plants from last winter! Previously planted in the summer was zipper cream peas and black eyes. They look great now and I picked some even. I planted Blue Lake Bush green beans yesterday. Rain was very important for our entire place. Fall is my most favorite season!! Posted in Vegetable Gardening in Dallas and tagged Bluebonnets, Dallas County Master Gardener, Dallas County Master Gardeners, dallas gardens, Dallas vegetable gardening, Fall Gardening in Dallas, growing bell peppers, growing kale, growing spinach, spinach and kale in the garden, Squash, vegetable gardening. Bookmark the permalink. First of all, I need to confess this is not my farm and these are not my pictures or Starla’s. Patti Brewer from the Master Gardener class of 2012 took these pictures and runs the family farm pictured below with her husband and family. Patti, where is this crazy beautiful place? The farm is in Lone Camp, Palo Pinto county, Texas. Palo Pinto county is the beginning of the northern hill country. I am not sure of our farm’s exact date of purchase but my mom who was born there would be 100 years old this year. Land was purchased at different times and some of it was owned by my great grandparents. Some of the land was partitioned to their sons and daughters including my grandfather. Your farm is meaningful to your family but also important in terms of habitat. Who shares your farm? Wild life on this farm include turkey, dove, deer, aoudad-or Barbary sheep, coyotes, cotton tail rabbits, roadrunners, hawks, buzzards and skunks. Of course, we have rattlesnakes and copperheads.We occasionally see horned toad lizards and have a decades old hill of red ants that stretches as wide as my outstretched arms reach. Red ants are #1 on the diet for horned toads. We have Texas spiny lizards too. Birds we see are hummers, house wrens, cardinals, blue jays,tufted titmouses, chickadees, meadowlarks, whippoorwills, and owls. We have once or twice seen painted buntings. In the area are habitats of golden cheeked warblers, an endangered bird. We have 5 tanks on the ranch and seasonal creeks and a rocky canyon area where the aoudads hang out. Patti, Could you tell us about the barn? The barn used to hold livestock feed bags. A hand cranked dried corn shucker driven by gears was in barn until it was stolen. Field corn was grown by my grandfather for supplements for cattle and chickens. It was fun to crank that old thing. The corn shuck was ejected when the kernels all popped off! What about the wildflowers. We are drinking them in!!! Just gorgeous! These pictures are from March/April 2017, when we had a trifecta of blooms at one time. 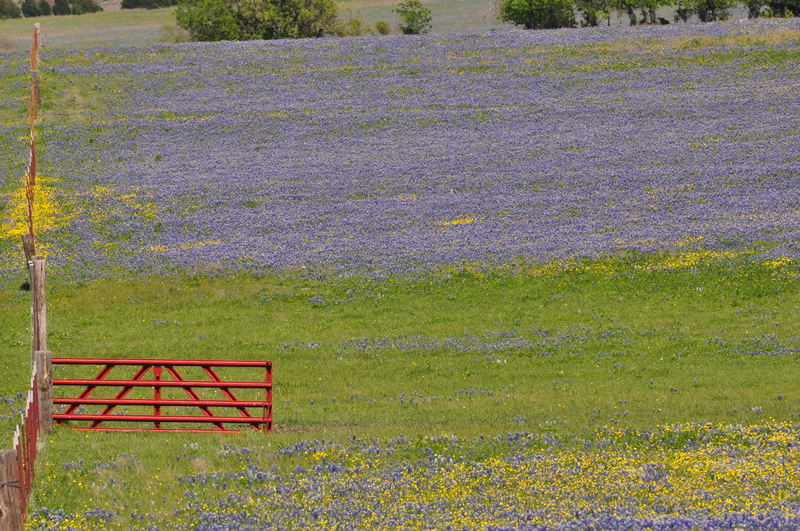 Bluebonnets, pink phlox, orange Indian paintbrush and crossvine on the fence. This year we only had phlox and bluebonnets at the same time, but amazingly thick stands of bluebonnets. Bluebonnets, we can’t get enough! 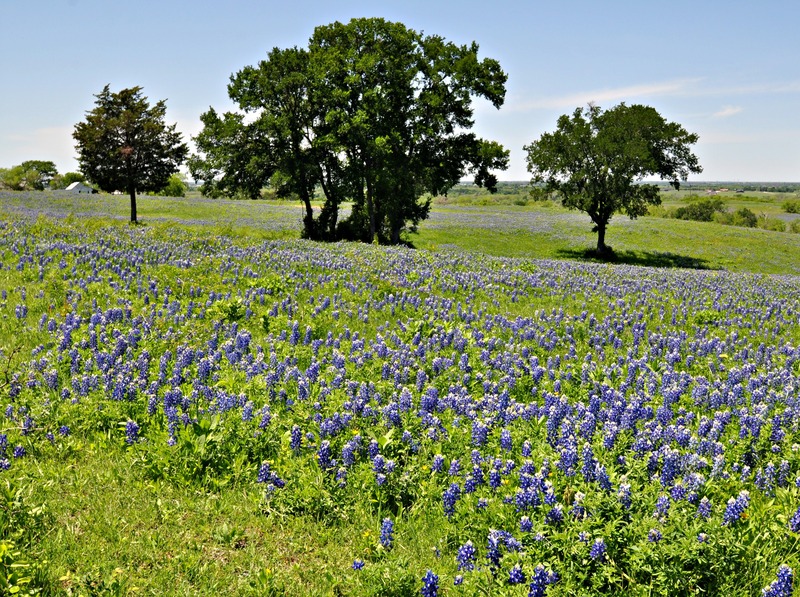 More about the wildflowers: we do not mow any bluebonnets until seeds are thrown out. The first mowing of the bluebonnets occurs usually right before July 4th. Mowing continues through about late August if needed. Texas heat burns everything up by August. Harvested bluebonnet seeds are given to friends. If you have never been in a field of bluebonnets that are throwing off their dried seeds, then you are missing something to behold. What you hear sounds just like popping popcorn on the stove. The first time I heard this I thought a rattlesnake was very close to me in the knee high bluebonnets! The Indian paintbrushes are mostly in pastures that we don’t mow. Unfortunately, our cows eat the Indian paintbrush that grow in their pastures. About May or June every year we have another field that sprouts Indian blankets and then that field is not mowed until the seeds are dried on the plants. We have an abundance of antelope horn milkweed and some butterfly weed and I have planted frost weed for years. We see a tremendous variety of butterflies including Monarchs. Bumble bees and honey bees are busy at our farm. Sitting outside on a summer evening listening to the hum of the honeybees is one of my favorite things to do. Posted in Wildflowers and tagged Bluebonnets, Dallas County Master Gardeners, Indian Paintbrush, Texas wildflowers. Bookmark the permalink. There is so much possibility in a seed, except if you leave your seeds sitting on a counter, or in the garage, or in your imagination. Poppy seeds should be planted now. At the Demonstration Garden ours flourished in the less tended, driest soil. Poppy advice from the Dallas Morning News here. And don’t forget to sow Bluebonnet seeds. 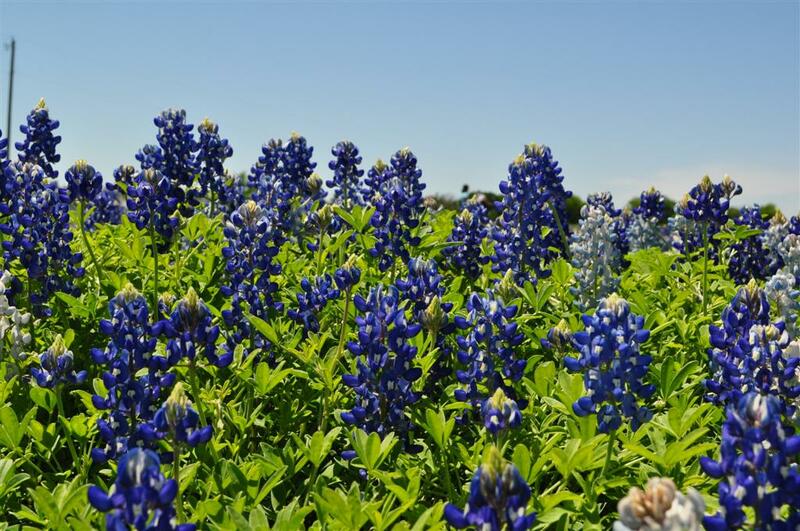 You may recall we promised to prompt you to plant Bluebonnets. 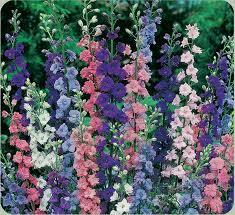 Likewise Larkspur seed should be planted now. Oh dear, some of my dried Larkspur stalks from last spring are still sitting in my garage with viable seed. This is a reminder to me as well! Posted in Fall and tagged Bluebonnets, Larkspur, Poppies. Bookmark the permalink. To get this field of blue, you have to plant seeds in the fall when spring thoughts are distant. If you need a little reminder, we will be happy to oblige. In October we will remind our readers to plant Bluebonnet seeds. And remind you to purchase a field. And to paint the gate. Posted in Spring and tagged Bluebonnets, spring blooms, Wildflowers of Texas. Bookmark the permalink.